Last week we had the chance to work on our own projects for most of the class. This week has been a little hectic for me as I’ve switched projects and joined another group. I am now currently working with Anjali on her little robot. We will be using raspberry pie to complete the tech portion of our project. 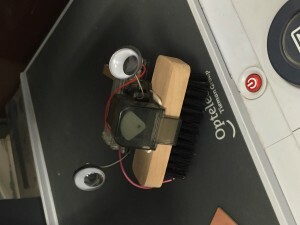 The little robot will be able to Speak out of its mouth, Videotape through its eyes and record though a mini microphone that we will be attaching somewhere. Currently I’m trying to decide what materials would work best to design the robot fast and efficiently. The robot will have a pretty big body to allow it to hold the raspberry pie board. Therefore we were thinking maybe we could laser cut all the larger parts of the robot and 3D printing a lot of the little part of the projects just so we can apply multiple things we learned this semester and apply it to our project to kind of come full circle. As I just entered this project I am still working on the design of our robot and as of yesterday the design restrictions have changed so now the robot will most like have a large rectangular body and short and narrow head so the camera and microphone and properly fit inside of the robot. So im really excited to create a cute looking robot that fits these restrictions. 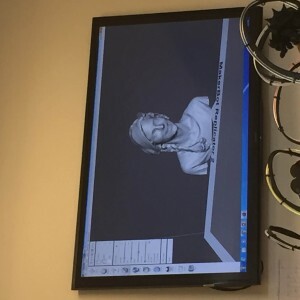 On Monday we were able to learn about MessMixers and make 3D scans of our faces then use this technology to fix up and smooth out the 3D scan to make them even nicer looking than they already were. It was a really awesome thing to experience. 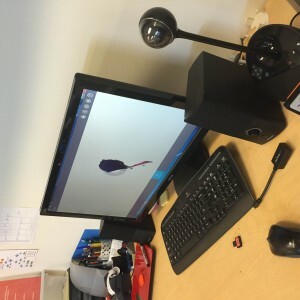 The program was so easy and simple to use we were able to successfully create 3D images using both scanner. Ariella Rausin also came in and gave us a mini demo of MessMixer after some of us had already completely our scans and it was really fast and simple. The IPad scanner I felt was a lot more user friendly compared to the desktop scanner and it might have been because in on we were moving the machine verses the persons moving and having the machine be at a standstill. Once I set up the equipment and was able to upload my 3D scans on to MessMixer edits it within 10-15 minutes. Which then was each unloadable into Cura. 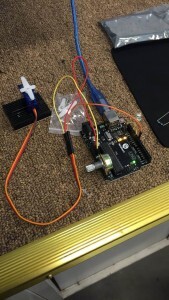 Monday was our last day at the FAB Lab, and I want to able to learn how to program Arduinos. 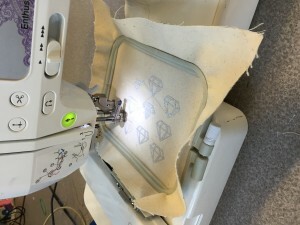 I was able to learn how to Digitally Embroidery the first week we were there and the second time around I got to learn how to use a new program that was free and accessible by anyone in order to laser cut. Arduinos was probably one of my favorite things that we got to learn at the workshop and I was grateful to have it saved for last. It really showed and taught us that we don’t need to pay hundreds of dollars to get small little things fixed in the tech items we all own like our desktops, and phones. Sometimes there is only a little tiny cheap piece of wiring broken in our items that is really easy to fix and replace if we just did a little research. 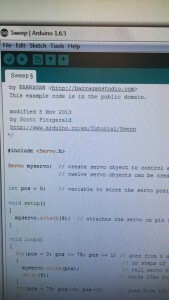 Even when it came to programming the Arduino it was much simpler than I thought it would be. There are hundreds of prewritten codes that we can find anywhere and everywhere. All we have to do is find something similar to what we want to accomplish with our code and tweak it a little bit so that it does. We never need to really start from scratch if all we are looking to do its simple things. I found that really cool and interesting that people just post codes online that make life 100 times easier for us folks that struggle with it. This semester Paige Lee and I have teamed up and our workings towards a problem that we don’t think of until it happens to us almost everyday if we regularly wear glasses. Image wearing your glasses and trying to lay down on a sofa or your bed in between classes just to watch a the most recent Snapchat videos or scroll through Facebook before you have to continue on with your day. As soon as you lay on your side your glasses get pushed across your face and now your vision is block by your glasses rather than your vision being improved with them on. So our solution is to create something that one can attached to the side of their frames so the device can prevent the glasses from moving when someone lays down. Wearing glasses now a days is a trend so there are more people that wear their glasses over contacts regularly now. This problem effects a larger group of people in this generation. Currently we have been working through many iteration of prototypes for a design for this device and even studying up on possible materials that we can either line the 3D printed device with or even possibly print with a softer material that will help this device be of more use right off the bat rather than it just be used as a prototype made of an almost plastic materiel that would be uncomfortable when attached to your face. We have been using Fusion 360 for out iterations since it is a program we have focused on in class. The program has proven to be very helpful as it is easy to use. 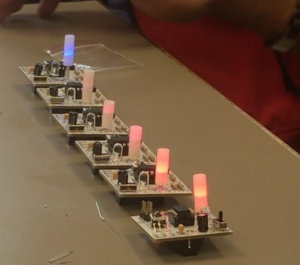 On Monday March 14, 2016 we were graced with the presences of Mitch Altman as he gave us a very insightful workshop on Soldering as we made “Trippy RGB Waves”. He is an alumnus of The University of Illinois Urbana-Champaign and while he attended the University he received both his bachelors and Master’s degrees studying Electrical Engineering. He is one of people that took his passions and hobbies a turned it into a successful business. He owns his own company called Cornfields Electronics. The invention he is most famous for is a little key chain called “TV-B-Gone”. This is just a single button that can turn off any TV. Mitch Despises TV so this was his solution for his own personal use but it turned out to be something that many people wanted therefore he turned it into a major business. TV-B-Gone isn’t all that Mitch Altman is known for, he was a student with quite a wild side. While he attended the University in 1977 he co-foundered “Hash Wednesday” a well-known UIUC holiday back in its day. This holiday is comparable to today’s Unofficial St patty’s something that the students love celebrate here and the University looks down upon tries to use all the preventive tactics they can so the event doesn’t take place. Hash Wednesday was a day where students and kids from miles away would gather on the quad to smoke marijuana. They would all pitched tents, play games like Frisbee, play music with guitars, and even sell t-shirts, And Mitch was behind the entire event. This link below is a TEDTalk that Mitch Altman spoke at in Brussels, it is about The Hackerspace Movement, but outside of that he also talks about how he reinvented himself so he was someone he like and enjoyed being. It is a great TedTalk and if you wanted to learn more about him definitely take this a few minutes to watch it! Mitch seems to be a very well rounded person and that was easy to see last Monday, he was very helpful and was constantly making sure we all understood what we were doing throughout the entire workshop to ensure our end products would work as needed. As many of the students in BADM395 didn’t know much about soldering walking into the class period at the end of it many of us were excited to learn more and do more with soldering and Arduinos. The way Mitch helped us understand what we were and why we had to solder the way he told us too really helped us enjoy the workshop even more. Many of the students really only had a theoretical understanding of how to soldering which that had had learned through watching and reading about. This workshop took all of our 2D understandings of Soldering and turned them into a 3D understanding. Here is another video were Mitch talks though how to solder. Mitch Altman was a great presenter and we were all very excited to have him in class and talk to our class through soldering while we made some trippy LED light waves. If you ever have to opportunity to meet him we high suggest you take the time and just talk to him for 5 minutes. 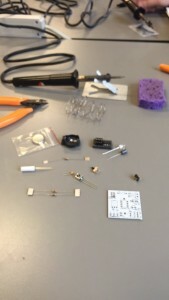 On Monday I learned how to soldering for the first time ever, it was all thanks to Mitch Altman. He’s the creator of “TV-B Gone” a key chain that essentially and universal remote that can turn off any TV within a certain area. He has this awesome idea where he wants to teach everyone to solder. He has make awesome tutorials and kits with Cornfield Electronics his company to help people learn and know more about soldering. He has made a living doing things that me loves and he encourages everyone to do the same. During the workshop he said “If your unhappy with your job in the future, just call me, I’m really good and convincing people to quit their jobs.” I thought that we was really interesting, he wants everyone to be able to do the things they love. 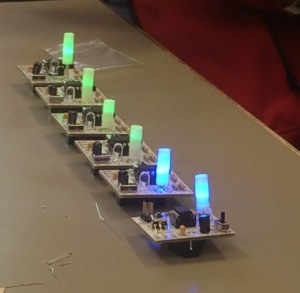 We learned how to solder this things called a Trippy RGB Wave, they are these led lights that are programmed using C I believe, to follow a pattern of light colors starting with Red, Green and Blue. The kits are made nicely to where everything is labels and organized so that anyone can easily figure it out. And the places to solder are far enough apart so that nothing overlaps to avoid mistakes. Mitch did a great jobs of going throw everything and making it really simple so that we all could go home with a trippy RGB light. Before Monday I never really understood what soldering was and now I feel really dumb for not know what is was I feel that is something what everyone should know about. It’s a skill that can prove to be very useful for so many people. This Week we were at FabLab again for our 2nd round. 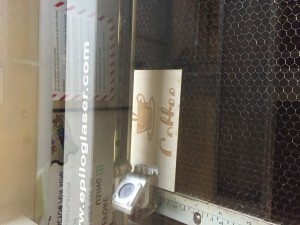 I got to learn about Laser Cutters and how they can do so much more than model buildings. All I ever used laser cutters for was to design and model building for architecture studio other than that I haven’t really gotten to experience all the cool things I can use laser cutters for. I also was able to learn a new software called inkscape which is similar for Adobe Illustrator but is free for unlike Illustrator which requires monthly payments. This just shows me that we can all do creative things on our computers without having to pay for really expensive software’s. 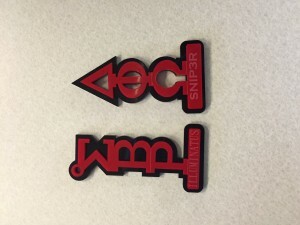 I was able to laser cut these two keychains I had designed prior to coming in this Monday. I was hoping to try to laser cut these files. I was able to take AutoCad Files and convert and edit them in inkscape then convert them into PDFs and get them printed. 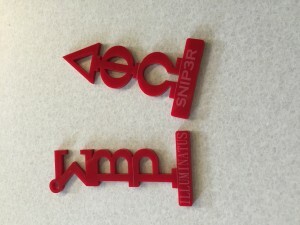 After I got my key chains cut I showed some of my friends in fraternity and sororities around campus and they were all asking if it would be possible for me to make them some as well. I feel like I can make a fun little side business out of this. I have all the means and the access to all the things I would need and to make them and it is not expensive at all either. I remember our first day at the FabLab they said one of the workers there runs a little Esty account on through the FabLab. I think that would be so much fun to do If I could create make and sell things for a little extra income as well. This week we had an amazing experience at the FabLab. This campus has so many resources that I am still learning about as a senior in college. Now I feel like I only got to experience a tiny little percentage of this campus during my time here and I’m eager to learn and experience everything else this community has to offer to students before I am forced to leave. While we will be attended that FabLab for 2 more weeks, this last week my group learned about Digital embroidery. It’s a very fascinating concept were we can take any image assign it colors (spools of thread), load it up to the sew machine and watch it embroider anything you want. It is very fast and simple and I wished I had known about this resource earlier in my career as student of the University. 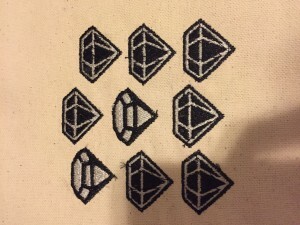 I was able to make little embroidered Diamonds that I plan on patching on my to Sorority Line jacket so that they can represent the ladies that I love and hold so dear to my heart. Now we have to ability to now only we able to work with 3D printers but also all of these machines and tools at the FabLab, which will help us better our semester project which will be a device that can help you keep your glasses straight on your face when you lay down on your side on a bed or a sofa. Throughout this week and last week we had a major crash course in Autodesk Fusion 360, while it was quite fast passed we had a lot of fun learning it and it was very informative and helpful. We learned how to make a lamp from beginning to end this last Monday and the Monday before that we were taught all the basic functions and keys to help navigate us throughout the fusion 360 platform. I was able to recreate the item I printed out in class during out 2nd week of class, which was a wine bottle opener. I was really fascinating to see how simple and user friendly Fusion 360 is. I have a very strong background in a few Autodesk product like AutoCAD, Revit, and Rhinoceros therefore a lot of what we learned in class felt like a review. Other things we went over though really amazed me. The simplicity of Fusion 360 and user friendly platform really won me over. Fusion is much simpler than many of the other software’s I use but still enhance enough to where we can design and create crazy awesome products. With all the new things we learned we able to make our own little object, and then start to think of things and start designing our own semester project for this Digital making class. Paige Lee and I were discussing problems we have in our everyday lives. One of the things we thought about was how when someone who is wearing glasses attempts to lay down on his or her bed to just watch a little TV and scroll through Facebook for a bit. When we try to lay down on our sides with the glasses on we find that our glass get pushed over and all we see is the frames of our glasses rather than being able to see though the lens into ours screen. we realized its a very first world problem,but this class is about experimenting and having fun and we think this problem is something that many people are realizing these days. What we want to do now is create a device that we can attempt to attach to the side of our glasses to prevent them from shifting over as one turns to their sides on the bed. 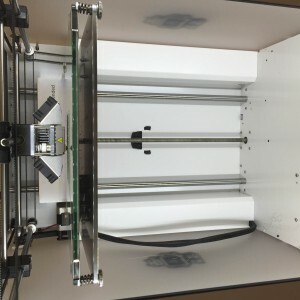 This device will most like have to made from something other than the plastic material that is in the 3D printers in out lab currently therefore we will have to try playing other much softer materials. This experiment with materials will also add and new more interesting dynamic to our end product and all the iterations that we will develop over the rest of the semester. Last Monday in class WHAT happened was that we had the pleasure of working with Design for America. Its and amazing organization that more or less designs for a person. Rather than trying to adapt ideas into the lives of people. They think of ways to help benefit people not only in their towns and cities but all around the world with this 6 step plan which is an innovation in itself, the way it allows you to work and think through your ideas is truly helps make these ideas into reality. It’s the process of design and understand a problem and splits it up so not every has to happen all at once. It is really well deconstructed so that when you do go through all the steps successfully you will be where you want to be with your ideas. SO WHAT does that have to do with digital making? It’s actually quite simple. 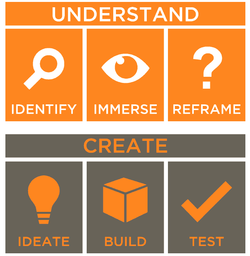 Design For America (DFA) helped the students in BADM395 experience this process for designing though innovations with the help of a few tools. We were able to identify a problem we felt close to (in my case it was a Blind College Student names Jess) and help think of ideas and ways that we might be able to make her life a little simpler as a college student. It was really and fun and educational to think all the steps necessary to create a working and useful product. There are so many steps and you have to continue going back and forth on your ideas and design because nothing is truly ever perfect the first time around. With all the new information on innovated design that was just given to our class NOW we will take all this new knowledge and cater is to our needs and relate it to the digital making skills that we will learn throughout the semester and marry them together into something that will be our own new and innovated creation.